10 days in Spain during August, itinerary guidance needed! Alan1950 hasn't logged any travels yet. » Ask Alan1950 a question about Western_Sahara. 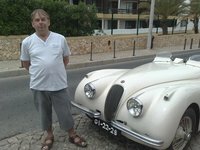 » Ask Alan1950 a question about Senegal. » Ask Alan1950 a question about Mauritania. » Ask Alan1950 a question about Morocco. Have travelled independently to various parts of Spain. » Ask Alan1950 a question about Spain. Live in UK for over 50 yearss. Travel by train preferably. Knowledge of non-tourist London. » Ask Alan1950 a question about United_Kingdom. » Ask Alan1950 a question about Portugal. Alan1950 hasn't been active in the wiki travel guide yet. Have you?